SHF # 34: Goin' Local with Bobcaygeon Chelsea Buns! | What Smells So Good? SHF # 34: Goin' Local with Bobcaygeon Chelsea Buns! Well, OK... I know that the original Chelsea Buns as we know them originated in England. And I know I'm very much Canadian (and darn proud of it!). But hear me out, there's a story, I promise. 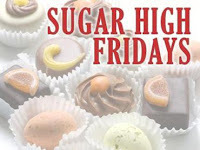 This month's edition of Sugar-High Friday (created by fellow Canuck The Domestic Goddess) is being hosted by Johanna of The Passionate Cook with the theme of Going Local. The first local desserts I thought of were, I confess, quite boring for my tastes because they were so stereotypically Canadian. Although, I guess that kind of was the point of this excersise, but really, how many versions of nanaimo bars and butter tarts do we need out there? I (and Andrew especially) do love those desserts, but there is one that trumps them both in my book, and it is the Chelsea Bun from a little place known as Grany's Bakery in Bobcaygeon, ON. By the way, this is the same Bobcaygeon that the Tragically Hip sing about on their album Phantom Power. But I digress. Every time I go up to Bobcaygeon (about a 2 hour or so drive from here) I make it a point to stop in at the bakery and pick up a box. They are simply to die for! sweet spice mixture. Prior to being rolled into a square spiral shape the dough is spread with a mixture of currants, brown sugar and butter. A sweet glaze covering is added before the rolled-up dough is sliced into individual buns and baked". I just say they're darn tasty, and better than the usually over-iced goo-filled American Cinnamon Roll. The recipe I'm using is also very local, as it is an adaptation of one from the Ontario 4-H Club. I figure you can't go wrong with something from the people who bring you what you eat! Combine ¼ cup flour, sugar, salt and yeast in a large bowl. Heat water, milk and oil until very warm but not boiling. Stir hot liquids into dry ingredients with a wooden spoon, beating well. Beat eggs until frothy and mix into batter. Mix in enough of the combined, reserved flour to make a soft dough that does not stick to the sides of the bowl. Turn out onto lightly floured counter. Knead about 10 minutes, until elastic. DO NOT UNDER-KNEAD. Grease two 9” round spring-form pans. Mix brown sugar, cinnamon and butter in small bowl. Add water and blend to liquidy paste. Pour one quarter of this mixture into the bottom of each pan and spread to cover. Cut dough in half, and roll each half into a rectangle about 35 x 22 cm. Spread each rectangle with the remaining butter, sugar, cinnamon and water mixture, sprinkle each rectangle with ¾ cup raisins. Roll rectangles very tightly in jelly-roll fashion, beginning at short side. Pinch edges to seal. Cut each roll in half, then cut each half into 2 equal pieces. Cut each piece in half again. You will have 16 pieces total when finished. Put pieces, cut side up, on top of butter, sugar, cinnamon mixture in pans. Cover with greased wax paper and tea towel and set in a warm place to rise. Let proof until doubled, 50 minutes. Bake rolls for 30-35 minutes, until golden and fragrant. Immediately flip pans upside down onto wire racks with tin foil underneath and let syrup run over buns. Remove pans after 5 minutes. These are best served warm but can be kept refrigerated up to a week. Reheat in microwave or low oven before serving. For those of you who will be in the Bobcaygeon area, Grany's is located at 9 King St. E., P.O. Box 953, Bobcaygeon K0M 1A0705-738-3377. Gloria & John Trelford are the wonderful owners and are always willing to talk to you about their products, the town, or anything you want! P.S. Andrew has since told me that this wonderful bakery was closed when he last visited. Hope it's not for good! P.P.S. The Healthy Summer Dessert round up for Blog or Bust #2 at the Clumsy Cook is up, right HERE!! i love chelsea buns and i don't care where they really come from, i just love them! i made some with apple and cinnamon earlier this year... also divine. thanks for taking part in SHF34! We used to go on a fall art tour in the Haliburtons when we lived in Oshawa. There was also a similar tour in the Ganaraska Forest near you. We would visit artists and crafters in their home, as well as deer and pheasant farms, home bakeries, canoe builders and even the maker of "Wrinkles" the dog. Chelsea buns sound like something I have had but didn't know the name of. They sound wonderful of course!!!! 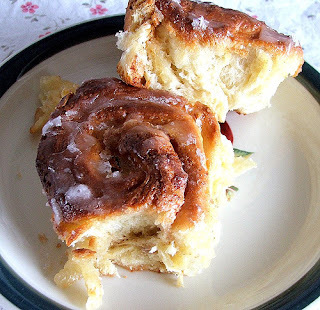 Yum, Chelsea buns are delish - thanks for posting this recipe.